Sportsbook.com is a USA-friendly poker room on the Merge Poker network. Sportsbook offers a $1,000 deposit bonus, a top notch poker rewards program, and the highest credit card acceptance rate in the industry. USA Players Please Read - SportsBook Poker does not accept USA players. Please see our list of US online poker sites. If you would like a quick look at Sportsbook Poker, press play to watch the Sportsbook Poker video review below. Or, you can scroll down and read our full textual review of the site. Ready to play? Visit www.Sportsbook.com for your $1,000 bonus. Sportsbook Poker (www.Sportsbook.com) has been involved in the online gambling industry since 1998, when they launched their online sportsbook. Since then they have expanded into the online casino, horse betting, and poker markets. Sportsbook.com has custom casino and sportsbook software, but the company partnered with CakePoker.com for their online poker room. This partnership gave Sportsbook.com an instant player base, which helped their efforts to build a brand immediately. Their poker sign up bonus is one of the biggest in the industry, and we really liked their software and support. We also have rated Sportsbook Poker as one of the easiest to beat poker sites. The Sportsbook Poker lobby is set up similar to most online poker rooms. When you first open the program you see a news box that notifies you of the latest events at Sportsbook.com, as well as upcoming tournaments. Also, there is a box in the bottom left that provides sports betting odds for upcoming games and events. One unique feature we really liked was the clock in the top right corner of the lobby. This makes it easy to determine when tournaments are starting, because most poker rooms use GMT and not your local time. At the top of the lobby you will find the standard buttons: Ring Games, Tournaments, Cashier, Rewards, My Account, Help, and Options. When you click the Ring Games button, you are presented with further options that allow you to filter by game type (Texas Hold'em, Omaha, Omaha Hi-Lo, 7 Card Stud, 7 Card Stud Hi-Lo), Play or Real Money, and Limits (Fixed Limit, Pot Limit, or No Limit). We wish Sportsbook.com allowed you to filter based on stakes, but for now you just have to sort through all of the stakes for your selection. If you go to Tournaments, you have quite a few more filters. You can sort the tournaments by tournament type (Scheduled, Satellite, Gold Card/Gold Chip, Freeroll, Event, Private, and Sit and Go), Game Type (Texas Hold'em, Omaha, 7 Card Stud), and Limit (Fixed, Pot, or No Limit). One feature that Sportsbook offers that really sets it apart from other sites is their table statistics. In the bottom left corner of the table (where the chat box usually is) you can click a button called Stats. This gives you an instant account of your poker play, and tells you your percentage of flops seen from the Small Blind, Big Blind, Other, and Total. Also, it shows you your Hands Dealt total as well as Showdowns Won, and Other Wins. This is useful for the analytical player who likes to make sure his/her stats are in line. Sportsbook.com offers resizable tables, but they aren't completely resizable like PokerStars'. Instead, you can choose from Minimum, Default, and Maximum size, or you can also Cascade or Tile the tables. All of this can be done in the bottom left corner of the table. Learn how to download Sportsbook poker for more info. Sportsbook.com offers promotions including a $1,000 sign up bonus and a $500 freeroll for new depositors. Sportsbook Poker offers a 100% up to $1,000 bonus to all players who sign up through the special links on this page and use promotion code PSITEORG at sign up. The $1,000 bonus is only available to new players who have never made a deposit at the Sportsbook.com poker room. This bonus made our list of best poker bonuses. When you make your initial deposit, the amount will be matched and placed into your Pending Bonus account, which can be viewed in the Rewards section of the Sportsbook Poker lobby. To redeem your bonus you simply have to create an account at Sportsbook.com, download the poker client, and make a deposit. Make sure to use Sportsbook promo code PSITEORG when you deposit to ensure the bonus is tracked to your account. Like I mentioned, after your deposit the bonus money goes into your pending bonus account. It is then your job to clear it from your pending account to your real money account. You do this by playing real money tournaments, sit and go's, and ring games. Every time you are dealt a hand at a real money ring game you are eligible to earn FPP's. For every dollar that is taken in rake, you will earn 1 FPP just for being dealt cards. This includes fractional points, so if you are dealt in to a hand that is raked $1.50, you'll earn 1.5 FPP's. Also, when you enter real money tournaments and sit and go's, you earn 7 FPP's for every dollar that is taken in tournament fees. In this case, if you entered a $30+3 tournament, you'd receive 21 FPP's ($3 fee x 7 FPP's). This also includes fractional points, so a $5+.50 SNG would earn you 3.5 FPP's. For more info on the Sportsbook.com promo code, check out my buddy's site SportsbookPromoCode.com. Besides the first deposit bonus, Sportsbook.com provides its new depositors with an exclusive freeroll, held every week on Wednesday at 10:30 PM Eastern Time. This is a $500 freeroll, and it is limited to players who have made their first deposit in the last week. You will often find beginner players in this tournament, and the field is very small because of the first depositor requirement, so it is a great way to boost your bankroll right away. Since Sportsbook.com is on the Merge Poker network, they already have plenty of traffic for being a newer poker room. For the most popular poker game, No Limit Hold'em, Sportsbook offers limits from $0.02/$0.04 to $50/$100. They also offer heads up tables (2 max) and shorthanded tables (6 max) to compliment their full ring games (10 handed). Although they offer stakes up to $50/$100 NLH, at the moment there are only tables running at the $10/$20 level and below. Sportsbook also offers Pot Limit Hold'em games, but none are ever running. For Limit Hold'em Sportsbook offers stakes starting at $0.04/$0.08 and running up to $100/$200. Once again, there are heads up, shorthanded, and full ring tables available. At the moment the highest game running is a $20/$40 6-handed Limit Hold'em table. The lower stakes tables are extremely soft, with many tables having a "Viewed Flop Percentage" of 65% or higher. Sportsbook.com offers Omaha High in Pot Limit and Fixed Limit stakes, but at the time of this writing only Pot Limit had games running. The stakes offered start at $0.02/$0.04 and run up to $50/$100, but the highest game running is $3/$6. 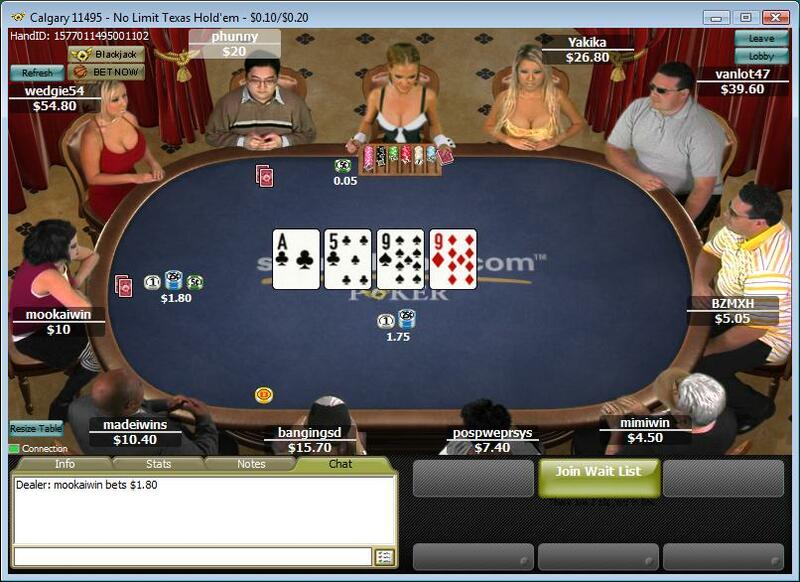 No Limit Omaha High is also an option in the lobby, but no tables are offered. For Omaha Hi-Lo, there are Fixed Limit, Pot Limit, and No Limit games. Fixed Limit stakes run from $0.50/$1 to $2/$4. Pot Limit stakes start at $0.02/0.04 and run all the way up to $5/$10, but at this time the biggest game running is $1/$2. Besides normal 10 handed tables, there are also shorthanded 6-max tables. For No Limit Omaha Hi-Lo, there are only three tables running right now: $0.02/$0.04, $0.05/$0.10, and $1/$2. Although the Sportsbook.com lobby shows Seven Card Stud and Seven Card Stud Hi-Lo, there are no tables when you click the tabs. This is probably something the site plans to add in the future. Sportsbook.com offers a nice lineup of poker tournaments for a newer online poker room. There are Limit Hold'em, No Limit Hold'em, Pot Limit Omaha, and Pot Limit Omaha Hi/Lo tournaments offered, but of course the main focus is No Limit Hold'em. Sportsbook Poker offers your standard lineup of guaranteed tournaments, and there is over $5,000,000 in guaranteed money every month. The biggest daily tournament is the $20,000 guaranteed $30 rebuy that is held every day at 21:00 Eastern Time. Sportsbook.com's big Sunday tournament is their weekly $125,000 guaranteed tournament, which is a $109 buy-in. Also, on the last Sunday of every month there is a $250,000 guaranteed which is a $162 buy-in. The tournament structure at Sportsbook Poker is similar to most other sites, and in regular tournaments players start with 1,500 chips with blinds at 10/20 and increasing every 15 minutes. Antes kick in at the seventh level, when you are already an hour and a half into the tournament. Sportsbook.com features a yearly contest to see who can accumulate the most Gold Cards throughout the calendar year. The player who ends the year with the most Gold Cards receives a $52,000 prize. Sportsbook Poker has run four of these Gold Card promotions to date, and a new one is about to start for 2010. Players earn Gold Cards by playing real money cash tables. Whenever a certain amount of rake has been taken from the table, a Gold Card shows up on the table. If one of your pocket cards matches the Gold Card, it is yours to keep forever. Keep racking up Gold Cards all year long to have a shot at the $52,000 prize. Besides just the $52,000 promotion, Gold Cards are also useful for buying into special Gold Card freerolls as well as exchanging them for real life merchandise. The 2009 Gold Card promotion is about to wrap up, so sign up at Sportsbook.com now to get in early on the 2010 Gold Card promotion. Gold Chips are another way to earn rewards at Sportsbook Poker. As players earn Frequent Player Points they also earn Gold Chips. The process has a snowball effect too, because as you earn more Gold Chips they become even easier to earn. Gold Chips can be used to buy into special Gold Chip freerolls, to purchase merchandise from the Sportsbook.com online poker store, or to enter normal tournaments at Sportsbook.com. Also, as players earn Gold Chips they build "Gold Stacks", which are simply stacks of Gold Chips. Players can visit the Rewards tab to see how close they are to completing the next Gold Stack. When players complete the first few Gold Stacks they earn additional free Gold Chips. When players complete mid-level Gold Stacks they receive reload bonus offers. When players complete the later Gold Stacks they receive cash deposits, directly into their account. Sportsbook.com offers email, live chat, and toll-free phone support. The Sportsbook Poker support team is friendly, courteous, and knowledgeable, and will handle your issues quickly and professionally. Visa, MasterCard, Cash Transfer, UseMyWallet, Moneybookers, NETeller. Wire Transfer, Check, UseMyWallet, Moneybookers, NETeller. NOTE: Deposit and Withdrawal options that are italicized are USA-Friendly options. Thanks for checking out our review of the Sportsbook Poker site. If everything sounds good, you can start playing by visiting	www.Sportsbook.com. Remember that Sportsbook.com features the $1,000 sign up bonus, the $500 new depositor freeroll, good player traffic, over $5 million per week in guaranteed money tournaments, and the Gold Cards/Gold Chips rewards system. Also, Sportsbook.com accepts all players, including Americans. To start playing, head over to Sportsbook.com and use promo code PSITEORG to receive the $1,000 bonus and entry into the $500 freeroll.